St. Paul voters punished incumbent Mayor Randy Kelly for supporting Republican President Bush last year, handing him a stinging defeat. Challenger Chris Coleman won the race handily and early with 69 percent of the vote, beating Kelly by more than a 2-to-1 margin. Opinion polls repeatedly showed voters in the heavily DFL city were angry over Kelly's endorsement of President Bush last year. St. Paul, Minn. — By the end of the campaign, the main question about the St. Paul mayoral race was not whether challenger Chris Coleman would win, but by how much. Going into Election Day, opinion polls showed Coleman leading Kelly by more than 30 percentage points. Kelly conceded the race barely half an hour after the polls closed. In addressing his supporters he evoked the Saint Paul skyline, where the number one blinks in neon atop the First National Bank building. "It's good to answer the question that that skyline asks," Kelly said. "And that's 'What comes first in St. Paul?' And the answer is the will of the people. The people have spoken. I say 'Amen. So be it.'" Kelly, a self-described life-long Democrat won 31 percent of the votes in a heavily Democratic city. Turnout was light, but the same as four years ago, at 29 percent. Kelly's the first incumbent to lose the mayor's seat in St. Paul in three decades. Opinion polls showed sentiment turned against Kelly largely because he endorsed and campaigned for George W. Bush for president last year. Kelly says his resounding defeat was evidence of how unhappy St. Paul voters were with his endorsement. But Kelly, who spent more than two dozen years representing St. Paul at the Legislature before becoming mayor, has steadfastly refused to second guess himself. "You know, I've made thousands of decisions in the 31 years I've been in public office," Kelly said. "I never look back at those decisions. Once I make them, I walk around a problem or an issue and then make those judgments and you live with them. So I stand by that decision." Over at Chris Coleman's campaign headquarters at the St. Paul Hotel, the new mayor-elect said voters' unhappiness with Kelly reflects more than partisan politics. "Let me just say this race has never been about George Bush, this race is about the city of St. Paul," Coleman said. "We all know that George Bush's policies are failing cities across America, including the city of St. Paul. We know that. This was a clear realization of that tonight." Coleman told supporters as St. Paul's new mayor he will be inclusive and make the city a national model for education, the environment, and the economy. "This is the St. Paul that we're going to build together," he said. "We won't get there unless everyone is at the table. From the beginning of this race I have said it is about who is at the table. Will we all be there when we plan out this future for the city of St. Paul." Coleman won 69 percent, or nearly 41,000 votes. Kelly's had a somewhat testy relationship with the City Council. City Council member Pat Harris says he voted for Kelly four years ago. But he says he was never in doubt this time he'd support Coleman, who served with Harris on the City Council. Harris says he's optimistic Coleman will listen. "It's not going to be agreement all the time," said Harris. "But it's all going to be focused about trying to find what the best thing is for St. Paul." 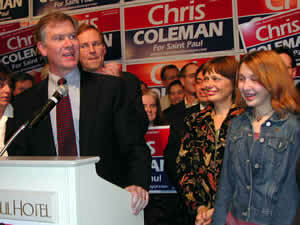 Hundreds of supporters attended Coleman's victory party including several prominent DFLers running for statewide office in 2006. State DFL Chair Brian Melendez says despite the fact that the race was between two DFL candidates, Coleman's win signals good things to come for Democrats in 2006. "We see the Social Security program and the national debt spiraling toward record shortfalls," Melendez said. "I think voters are getting tired of the way the country's being run. I think Randy Kelly made the mistake of embracing those policies." Mayor-elect Coleman is expected to head to City Hall on Wednesday to meet with staff. Mayor Kelly says he will also be at City Hall, laying out his final seven weeks as St. Paul's mayor. Kelly says after he wraps up some loose ends, he'll take a breather and then decide what's next after 31 years of continuous public service.